The premise of the short play Anyone Can Dance, is fairly simple: What could have happened had we met our partners years before – as children, teenagers, young adults? Local writer Sean Baker explores the question on stage in a story that is very, very funny at times, with an undertone of darkness and despair on occasion, and gripping from beginning to end. I absolutely recommend this lovely work and applaud the spot-on timing, excellent acting, clever direction and, of course, the playwright, who gave us this treat. Anyone can Dance takes us right back to the bare bones the idea of how we allOn through 16 September at Corpus Playroom, the clever two hander portrays Joe, played by James Inman, and Samantha, Lisa Wight, a couple who have been together for 6 months (or five months two weeks and three days as Joe keeps reminding Sam). think about our partners pasts -- whether we admit it or not. Set in their very messy bedroom – the reason for which becomes clearer as the action continues -- the characters bicker, chat and guardedly talk of their pasts until, with a click of a finger, they are transported back to different eras in time. We go back to different times of each of their lives, imagining they had met then – from when they were 9 and 14, right through to their actually meeting at an art class, with a particular painting cleverly woven through the last half an hour leading to a very touching ending. For each scene, the actors had to change clothes, grabbing, seemingly at random, but obviously not, different items from the floor to become their younger selves, turning them into people they clearly aren’t nowadays. Both Inman and Wight portrayed each phase of their lives with skill and dexterity and I look forward to seeing them in more productions. The first performance of the play, directed by Richard McNally, was in March at the Sawston Drama Festival, winning Best New Play; performances at Cambridge Drama Festival, the final of the all England Theatre Festival in Oxford, and the All England Final in Somerset followed. Last night, we were treated to this performance by BAWDS drama group at the quite gorgeous little Corpus Playroom, a tiny but perfect arena for it. 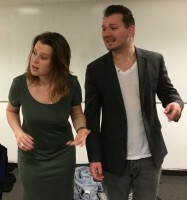 This two hander play sought to develop the long term relationship between a man and a woman. The action took place in Samantha's bedroom and the simple set comprised of a bed centre stage, a small table covered with a gold drape and a wrought iron bench. The set was dressed with what appeared to be a chaotic mass of discarded clothing. Lighting and sound were used very effectively. In particular they enhanced the many flashbacks which expanded the audience's understanding of the developing relationship. 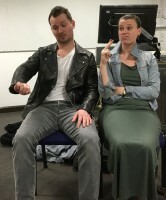 James Inman and Lisa Wight played the characters of Joe and Sam very convincingly, shifting emotions and moods as the play progressed. They fed off each other; there was a unity and cohesion in their acting and we could really believe in their love affair. There was tenderness and familiarity demonstrated as the couple metaphorically danced their way through the script. Richard McNally as director produced a slick example of drama. The use of clothes from the scattered piles was very effective in denoting the various vignettes. The play was originally written by the stage manager Sean Baker but it felt as though the whole company had been involved in creating this poignant and very watchable play. The adjudicator, Arthur Rochester awarded BAWDs the Winner's Trophy for the Eastern Area Final. It was a fitting accolade to an obviously very talent company. 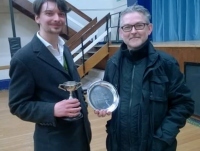 This is the report/review from the adjudicator, Arthur Rochester on the winning performance at Oxted, published in the theatrical magazine Sardines. First to perform were Bawds with Anyone Can Dance by Sean Baker, a member of the group and incidentally winner of the award for Best New Play at Cambridge. His naturalistic modern dialogue was splendidly delivered by Lisa Wight and James Inman as a couple whose six-month relationship was under stress. The reasons for this were made clear in a stream of what in cinematic terms would be called ‘flashbacks’ – incidents and exchanges remembered differently by each character, involving a wide range of shifting emotions, reactions and personal characteristics. Since each such episode takes place in a different time-frame, this also called for frequent and often complete changes of costume. Both actors had to strip to bare essentials and, in full view of the audience, find, put on and subsequently change garments from those strewn apparently randomly around the large stage. Their ability to accomplish this faultlessly, without the slightest interruption of the fast-paced dialogue, was a theatrical tour de force for which the director Richard McNally, must obviously share the credit. The switches of time-frame and location, which might easily have become confusing for the audience, were helpfully signalled by highly creative use of colour and sound, at the flick of the characters’ fingers, and the music, especially at the final curtain, contributed greatly to the ‘mood’ of the piece. Above all perhaps, the quite extraordinary degree of mutual trust and support between the two actors created a genuine and affecting dramatic impact which clearly communicated itself to the appreciative audience.